Earn Bonus Rewards. Earn a $10 certificate when your purchases total $150 or more. They will celebrate your birthday month by giving you 15% off your next purchase. Preview and purchase new collections before they are available to the public. Don’t miss these great offers. Its easy to sign up. E-gift certificates are the fastest way to give the perfect gift. Just fill out the online form of who you’d like to surprise, select an amount, and add a personal message – they will take care of the rest. Aerosoles has developed high quality, comfortable and fashion-right shoes at affordable prices. 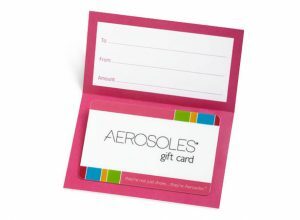 Have an Aerosoles Gift Card or Merchandise Credit? Just enter your card/credit number and pin during checkout. Want to know your Gift Card or Merchandise Credit balance? Use their balance checker to know how much you have available.